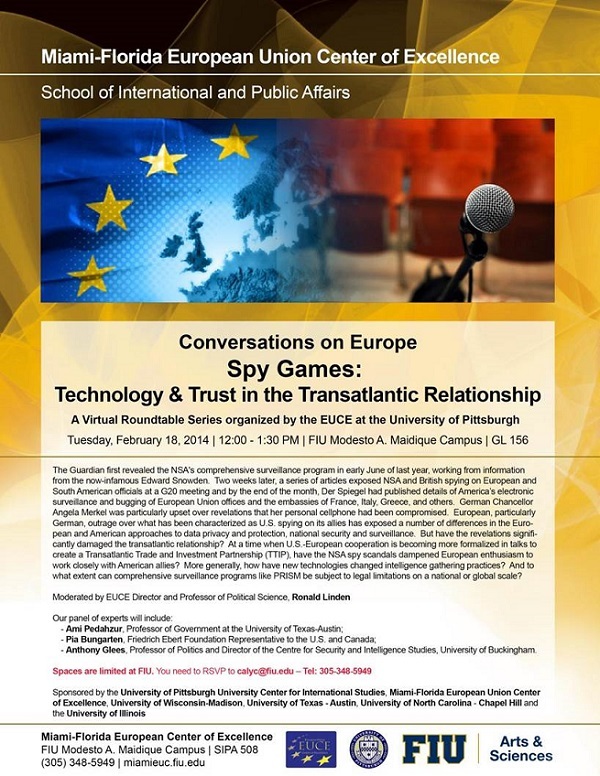 Conversations on Europe: "Spy Games: Technology & Trust in the Transatlantic Relationship"
Top experts on Technology and Europe will join specialists on the subject via videoconferencing across several sites. The Guardian first revealed the NSA's comprehensive surveillance program in early June of last year, working from information from the now-infamous Edward Snowden. Two weeks later, a series of articles exposed NSA and British spying on European and South American officials at a G20 meeting and by the end of the month, Der Spiegel had published details of America’s electronic surveillance and bugging of European Union offices and the embassies of France, Italy, Greece, and others. German Chancellor Angela Merkel was particularly upset over revelations that her personal cellphone had been compromised. European, particularly German, outrage over what has been characterized as U.S. spying on its allies has exposed a number of differences in the European and American approaches to data privacy and protection, national security and surveillance. But have the revelations significantly damaged the transatlantic relationship? At a time when U.S.-European cooperation is becoming more formalized in talks to create a Transatlantic Trade and Investment Partnership (TTIP), have the NSA spy scandals dampened European enthusiasm to work closely with American allies? More generally, how have new technologies changed intelligence gathering practices? And to what extent can comprehensive surveillance programs like PRISM be subject to legal limitations on a national or global scale? Anthony Glees, Professor of Politics and Director of the Centre for Security and Intelligence Studies, University of Buckingham. ► This event is organized by The University of Pittsburgh|University Center for International Studies, in collaboration with the Miami-Florida European Union Center of Excellence at FIU, the University of North Carolina, Chapel Hill; the University of Wisconsin-Madison, the University of Texas-Austin, the University of Illinois.